Wire Wheel, Original style Model T wire wheel. Wire Wheel, reproduction of model T wire wheel made by Ford. Excellent quality with correct bead and is correct size for 1925-1927. 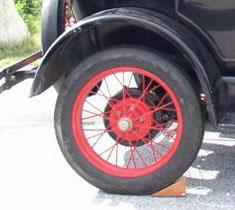 Wheel are painted with primer only.